Raise your hand if you still aren’t encouraged by the direction of the football program? For any of you non-believers out there, pull up a chair. It’s time to talk. Take a look at the results so far this season, including hanging with LSU. While I normally loathe the “moral victory, atta boy” garbage, how many people thought SU was going to get waxed by four touchdowns? Full disclosure: I was in that camp. Partly because of Dungey being cheap-shotted to the sidelines in the Central Michigan game and partly because, well, it’s still a bit hard to shake the “pending doom” feeling left behind from the He Who Shall Not Be Named years. The gift that keeps on giving. But I digress. When Tim Lester was handed the offensive reigns after the debacle that was last year – no need to relive the revolving QB merry go round and the fiasco that was the McDonald demotion – he floated the idea of running an offense that was tailored to best utilize the skill position players on the team. One of the results through four games this season has been the big play. And I’m defining “big play” as anything longer than 20 yards. URI is an FCS opponent so the results have to be taken with a grain of salt. That being said, Erv Philips hauled in a 32-yard TD pass while true freshman Dontae Strickland ran for a 21-yard touchdown. Fellow frosh Jordan Fredericks also broke off a 31-yard gallop. 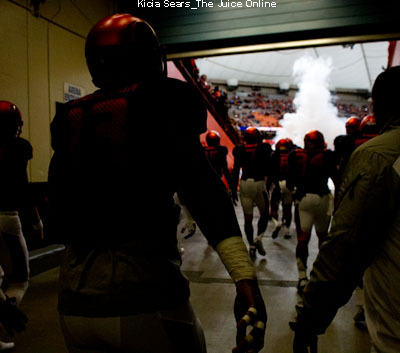 » Related: How does Syracuse football look through four games? 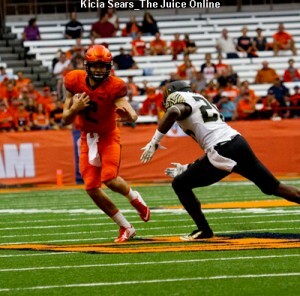 This was a critical conference game against an opponent considered to be in the same rebuilding boat as SU and that also brought a tested defense to the Dome. And for much of the day, Wake’s defense stymied the Orange. The game turned on two plays: an 89-yard TD strike to Brisly Estime and a 53-yard score to Steve Ishmael. Also against Wake, George Morris II broke a 34-yard run while Devante McFarlane and Kendall Moore nabbed catches of 23 and 21 yards, respectively. This looked like a potential high-scoring contest for both clubs until Dungey was knocked out of the game. And after scoring 24 points in the first half, the SU offense ground to a halt in the second half partly due to neither Austin Wilson nor Zach Mahoney being able to generate much from the quarterback position. Still, Strickland had a 25-yard touchdown reception, Ishmael’s lone catch of the day went for 62 yards, Fredericks had a 36-yard scamper and Dungey scrambled for 31 yards. In an odd type of way, this loss is making teams and big-time recruits pay attention. Estime showed off his speed against the Tigers by scoring on a 40-yard grab, returning a kickoff for 38 yards and returning a punt for 28 yards. The only other big play came from Mahoney’s legs; a 20 yard run. And it’s not just the offense getting it done. Estime had a 74-yard punt return for a touchdown against URI while the defense has taken two interceptions back for scores; a 24-yarder vs. URI by Corey Winfield and a 41-yarder by Donnie Simmons against Wake. Not every drive has to be 12-plays in 7:26 culminating with a 2-yard plunge into the end zone. 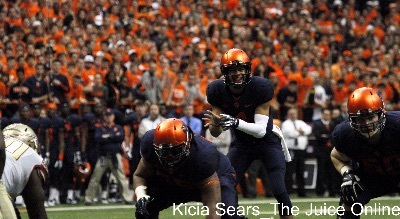 Teams must possess the ability to strike quickly and this Syracuse team has the speed to do so. The Orange can score from anywhere on the field in all three phases of the game and you can be sure opposing staffs are paying attention.